Every 66 seconds, an individual age 65 or older is diagnosed with Alzheimer’s.1 Are your clients prepared to face this retirement risk? Show your clients the facts about Alzheimer’s‌ ‌disease. 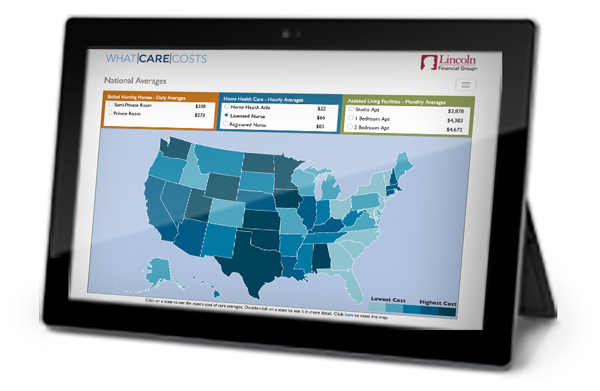 See the costs of LTC services around the country. Typically, these patients need twice as many hours of long-term care services compared to those without cognitive impairment.2 It’s important to plan for long-term care expenses when clients are healthy because once they exhibit signs of dementia they may be uninsurable. Make your clients aware of Alzheimer’s risk and the costs of care. Start planning to protect your clients’ retirement from long-term care expenses with affordable, flexible options beginning at age 40. Visit the advisor LTC planning site for a variety of tools and resources. 1 Kimberly Holland, “Life Expectancy and Long-term Outlook for Alzheimer’s Disease,” healthline, https://www.healthline.com/health/alzheimers-disease/life-expectancy#overview1, October 13, 2016. 2 Alzheimer’s Association, “2017 Alzheimer’s Disease Facts and Figures,” Alzheimer’s & Dementia, 2017:13:325373, https://www.alz.org/documents_custom/2017-facts-and-figures.pdf, January 2017. Lincoln MoneyGuard® products are universal life insurance policies with optional long-term care benefit riders.